Right now, UK trade paper Boxing News has a list of the worst facial injuries suffered by fighters. Ring magazine had a special a few years back, in which boxing’s bloodiest brawls and their bloodiest bleeders were recalled. In the same spirit, here is a list compiling half a dozen choices for the worst facial injuries suffered in recent memory by a big name pro boxer. A different kind of list, not to mention a quite gruesome one – but one that recognises a boxer’s bravery in ignoring pain, agony and blood! 6. Julio Cesar Chavez (Vs. Oscar De La Hoya) 1996. 5. Paul Hodkinson (Vs. Marcos Villasana) 1991. Paul “Hoko” Hodkinson may have had home advantage as he battled Mexico’s Marcos Villasana for the vacant featherweight title in June of ’91, but that didn’t help him in the slightest in the long run. Marked up horrifically around both eyes, Hodkinson was unable to continue in round number eight. Telling ref Arthur Mercante that he just couldn’t see, “Hoko” gave the official no other alternative. His face a grotesque mess, the young Hodkinson was totally beaten. His swollen shut eyes were truly a pitiful thing to witness. 4. Michael Katsidis (Vs. Csar Amonsot) 2007. The only guy on this list that actually won convincingly, Australian warrior Katsidis attacked his Filipino rival like a man possessed in many of the rounds in his tougher than expected U.S debut. “Rocky” paid for his lack of respect. The twenty-one year old Amonsot was as game as they come and proceeded to make a bloody mess of both of the unbeaten fighter’s eyes. Blood absolutely pouring from his left eye in particular, Kastsidis somehow battled his way to a points win. 3. Alan Minter (Vs. Marvin Hagler) 1980. If De La Hoya ripped Chavez’ face to shreds, then what did Marvellous Marvin do to Britain’s Alan Minter at Wembley in their world middleweight battle in 1980? Though he was the defending champion – having won the title from another bleeder in Vito Antuofermo – no-one would have guessed it after a mere nine minutes of the fight with Hagler. Minter, though brave, was utterly beaten due to horrific cuts over both eyes after less than three rounds. Indeed, Minter’s fans were so shocked at the suddenness of the defending champ’s injuries, they felt Hagler had inflicted them with his shaved dome. As we know, Hagler’s coronation had to be postponed due to the resulting pelting of beer bottles. Minter’s face was a disgrace, so too was the conduct of his fans. In no other fight during his long career had Foreman been so grotesquely transformed due to taking punches to the face. It wasn’t just Foreman’s eyes, both of which were mere slits at the end of the ten rounder. Nor was it simply his busted up mouth – misshapen and pouring blood as it was by the later rounds. The heavyweight legend’s face was pounded into something so frightening it could only be described as a horror mask. George himself, when being interviewed in the ring, made references to his likeness being akin to something out of an episode of “Tales from the crypt.” He was not wrong. This one was shocking. There have never been worse cuts suffered by a world heavyweight title challenger, perhaps ever – certainly not in the modern era. Klitschko’s face was brutalised by Lewis’ fists, his injuries bringing an unfortunate ending to a truly thrilling heavyweight rumble. Klitschko wanted to carry on, but there was no way he was going to be permitted to do so. Lewis has never forgotten this fight; neither have the fans. 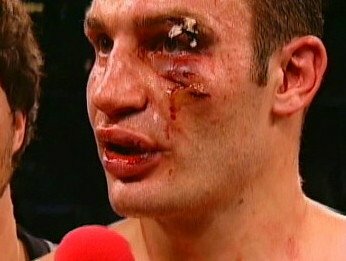 What would have happened had Klitschko not been cut the savage way he was? We will of course never know.